Updated March 21, 2019 : We spiffed up this post to make it sparkle! No changes to the original recipe. 1 Heat the clam juice and water: Add the clam juice to 4 cups of water in a pot, heat until steamy. Do not let it boil. 2 Sauté shallots; In separate pot (thick-bottomed), heat 2 tablespoons butter over medium heat, and sauté the minced shallots for 2-3 minutes, until just translucent. 3 Add the rice to the pot. Stir-fry the rice for 2-3 minutes, until all the grains are well coated in butter and are beginning to toast. 4 Add white wine and stir: Increase the heat to high and add the white wine. With a wooden spoon, stir the rice vigorously. Once the wine boils, turn the heat down until the wine is just simmering gently. 5 Add two ladles of clam juice water mixture: When the wine is almost cooked away – under no circumstances should you let the rice sizzle on the bottom of the pot – pour in two ladles of the hot clam broth-water mixture. Stir well to combine, and add a healthy pinch of salt. 6 Stirring almost constantly, let this liquid reduce until it is almost gone, then add another ladle of broth. Continue this until the sauce coats the back of a spoon. Taste the spoon and see if the risotto needs salt. If so, add a small pinch. 7 Now add in the shrimp, the parsley, and the remaining tablespoon of butter. Stir constantly until this last cup of broth is about half gone: Remember you want this risotto to be loose and creamy. Hello! All photos and content are copyright protected. Please do not use our photos without prior written permission. If you wish to republish this recipe, please rewrite the recipe in your own unique words and link back to Shrimp Risotto on Simply Recipes. Thank you! I was wondering about getting nutritional info on these recipes. Is that possible? Hi, Diane! We don’t currently calculate nutritional information on our recipes. I’d recommend using an online nutritional calculator like this one. Thanks! First of all, this is, bar none, my favorite place to seek out new recipes to add to my repertoire! My friends and neighbors are very thankful to you! We love making risotto and I was looking for something special to make this last Valentine’s Day, which is also my husband’s birthday. I was going to make this with shrimp but when I got to Costco, they had these huge lobster parts. I bought an arm with a giant claw. It weighed four pounds! I used the lobster shell, with all its luscious fat, and some of the shrimp shells I freeze from other meals to make a quick fish stock by simmering for thirty minutes. I add a splash of dry white wine to help extract the flavors and nutrients. I followed the rest of the recipe as directed. Besides adding some Red Boat fish sauce and slivered frozen artichoke hearts near the end when adding the chunks of precooked claw meat. This is by far the best risotto I’ve ever had or made! 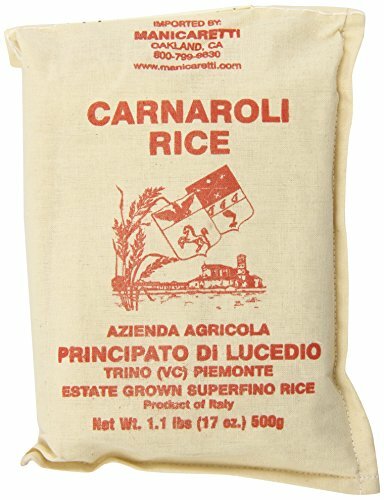 So creamy, succulent with risotto’s ability to amplify the flavors of whatever your main ingredients are. Lobster has never tasted so good! The next night, I also tried a twist I’ve been wanting to do. Reheating risotto is always been a bit of a let down compared to when its freshly made. Basically a glob of uniform starch. So I melted butter to foaming in my skillet. I made hamburger-sized patties of risotto and breaded them with panko and shredded Parmesan cheese. I sautéed them until caramelized , carefully flipping to do the same to the other side. The browning and breading brought a new depth of flavor and texture that paired well with a Caesar salad. Delicious. The best way I have found to use leftover risotto yet. Thanks so much, Elise! Hi Plant Man, I want to come to your house for dinner! Your lobster risotto made with shellfish stock and your risotto patties sound AMAZING. I found this recipe many months back when I was about to cook my very first risotto. I absolutely loved the effect and obviously cooked it many times since then. It’s my new comfort food. Thank you! <3 Btw, if you realize you've run out of parsley, changing the liquid proportions (less broth and more wine) can partially make up for it. I found this recipe rather bland. Made this a couple nights ago and I was very impressed with myself. :-) Can’t wait to try the asparagus risotto. A new fave. I made your Shrimp Risotto last night for dinner and it was simple and delicious!! Thanks for another great recipe! I am now completely over my fear of making risotto. The best looking risotto I’ve ever seen. Is there a non-alcoholic substitute for the wine? Wow – this looks great! We love risotto, and I’ll be making it very soon. It’s really too bad that the Maine native shrimp season just ended for the year. They’re tiny, bright pink, and delicious. They’d be perfect in this recipe! FYI, as Paula mentioned in the comments, those little “boreal shrimp” are the same “Maine shrimp” I rave about every winter. The scientific name is Pandalus borealis and they are also known as “Northern shrimp” and, in Eastern Canada, “Metane shrimp.” They are also available from North Atlantic, Oregon and Alaskan waters and are sometimes marketed as “salad shrimp” or “cocktail shrimp.” This is a sustainable fishery and a great alternative to farmed shrimp (more flavorful, in my view). The season for Maine shrimp closes this year in late May, by the way, so there’s still plenty of time to enjoy them. …and of course: thanks for the link(s)! I will make this soon. I haven’t had a seafood risotto in a while although we eat seafood every Tuesday! If I can just add a little something…the most common expression is risotto “all’onda” or “wave risotto” (in any case “sull’onda” means “on the wave” not under) and it refers to the characteristic “wave” that you get when the risotto is ready and you move the pot: as you said not too liquid, not too thick. But honestly, no Italian over three would think of eating it with a spoon…!